When you change your attitude to a more positive one, you will seem more relaxed and pleasant around other people. You may even give off a fun and happy impression. No one wants to be around someone who is negative or gloomy. 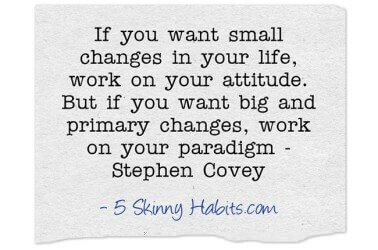 But Covey teaches us that if we want to make a deep and more significant change, we must change our ‘perception’ or what he calls our paradigm. When you change your perception, you will automatically see a change in your attitude and feelings. A change in perception is a change in the way you view things. It is almost a ‘belief’ change. You won’t be fighting against your feelings. You will automatically trigger feelings. For example, if you view a life challenge as a positive growing experience, you will feel upbeat and internally strong with the opportunity to excel and become a better person. However, if your perception is a negative one, you can still have a positive attitude but you will struggle with your belief, that the challenge is really an unfortunate experience. You will smile on the outside but resent the challenge on the inside. A paradigm shift means you are now smiling on the inside!